Children's books are wonderful. Many are joyful, funny, moral and beautiful. Some are works of art in their own right. Having a baby is a perfect excuse to dip back into childhood favourites and share them with my little one. In addition to the rediscovery of treasured copies from my childhood, the champion charity shopping mother has been on the rampage across the north, leaving empty shelves in her wake. She has amassed a spectacular collection for Culturebaby to read over the next few years. It is clear that she's teetering on the edge of addiction but it's one I'll support any day. There's so much amazing stuff out there for babies, both classic and new, that there is always something wonderful to discover. So it truly felt like Christmas the day another package of books from the lovely people at Macmillan publishing arrived at our door for us to review. Secondly, I read in a lovely book on childhood education by Dr Jenn Berman called Superbaby, that in addition to being a great way to bond with your child and foster a lifelong love of reading, opening a world of creativity and imagination, and producing a better attention span and memory and better listening, reading and writing skills; reading just three picture books each week has been shown to increase vocabulary by 15-40%. Of course she goes further and recommends three a day... This book also has some good advice for how to read with your baby and tips on activities to help them grow to love literature. Then today, in the new Montessori book Learning Together by Kathi Hughes, I was reminded of the fact that understanding far exceeds spoken language for a long time, and furthermore that research shows the importance of fathers modeling interest in books as well as mothers - there is apparently a clear link between how often a father reads to an infant in the first year and his child's interest in books later. Finally, and worryingly, a recent survey has shown that 2/3 of people do not read to their babies. 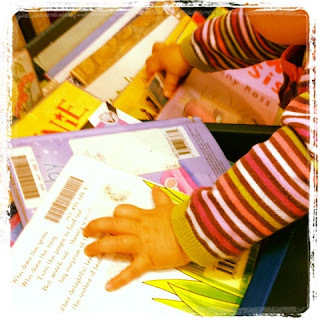 The survey, carried out on more than 500 parents of babies by ICM and the Fatherhood Institute on behalf of the charity Booktrust, found that 64% of parents were not reading with their babies at seven months, and that 57% did not own a single book until they received their pack of free titles from Booktrust's Bookstart programme. 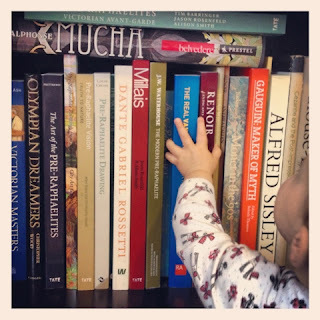 We've seen with Culturebaby that it's never too early to start. She loves books and plays with them alongside her toys. We were surprised at how young she was when she started to turn pages and look through books alone too. 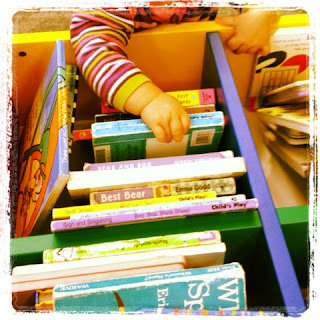 She crawls over to her book baskets and helps herself to one (or ten) that she fancies. This has at times led to chaos in the library (when she transferred the entire contents of one box to another and then to the floor), but I'm sure they'll forgive such a cute vandal... For some great very first books for babies in black and white see my earlier post here. 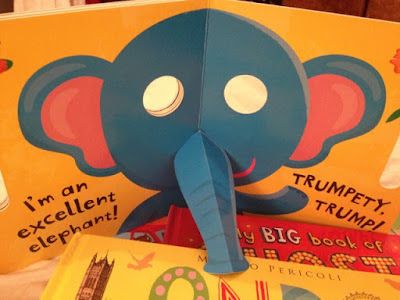 For supervised toddlers: My Big Book of Ghosts by Kate Daubney and Maggie Bateson and Funny Faces in the Jungle by Jannie Ho are both fun and brilliantly engineered pop up books that will appeal to a range of ages. With rather appropriate timing for the season, My Big Book of Ghosts follows the everyday life of a (rather cute) family of ghosts. 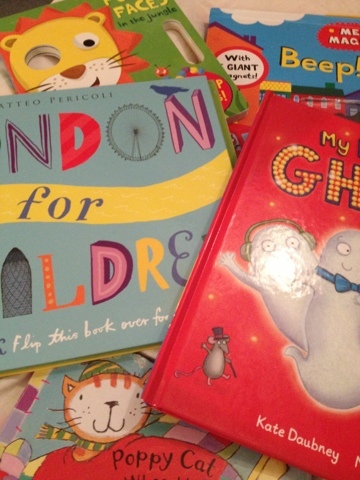 There is a mouse to spot on every page and a range of pop-ups and moving mechanisms that left Culturebaby laughing and squealing with delight - especially where the ghosts disappear from the bus (much to the surprise of other passengers). Similarly, Funny Faces in the Jungle becomes a clever set of masks complete with pop-up surprises. Culturebaby loved it when I peered through the eyes of the animals, replicated their noises and operated their jaws. 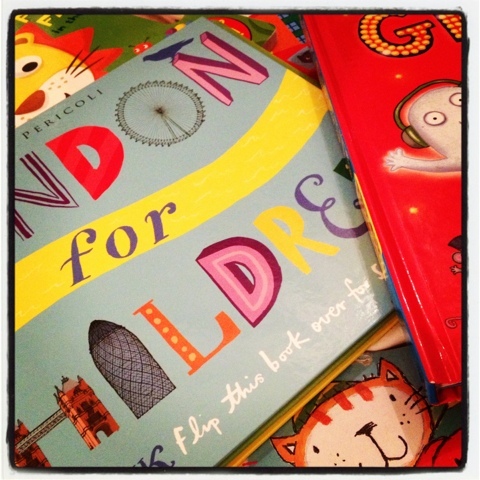 Again the book can be enjoyed on several levels - the older children thought it was great for their own imaginative play. However, beware little paws - our noisy frog has lost his tongue!